Heather Lang and Raul Colon have collaborated to share the exciting story of Ruth Law in the picture book biography, Fearless Flyer. Before Amelia Earhart won the hearts of Americans with her aviation accomplishments, Ruth Law was flying "daredevil tricks" and aiming to do what no other aviator had done before: fly nonstop from Chicago to New York. 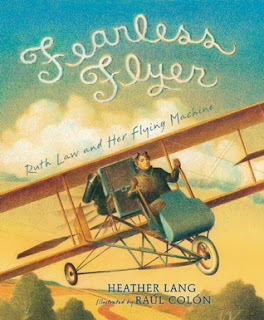 Instead of spending pages describing Law's childhood and how she became interested in flying, this story jumps right into the action on page one by introducing Law's goal of breaking flying records. "She made up her mind to fly from Chicago to New York City. When Ruth Law made up her mind, there was no use trying to stop her." Readers will be amazed by the work Ruth had to do to prepare for the trip including adding three gas tanks to her plane and cutting up maps and attaching them to rollers. Lang effectively embeds quotes from Law into the narrative. The excitement and tension builds as Law encounters problems during the record-breaking flight including high winds, thick fog and running low on gas. Raul Colon's pencil and lithograph illustrations in yellow and blue hues let readers know they are reading a book about the past. Back matter includes photos and more information about Law including the surprising fact that Orville Wright refused to teach her to fly. Pair Fearless Flyer with Talkin' About Bessie by Nikki Grimes, Soar, Elinor! 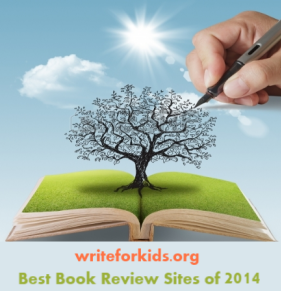 by Tami Lewis Brown or Daredevil: The Daring Life of Betty Skelton by Meghan McCarthy. I love the illustrations in this trailer. Looks like a great story about a pioneering woman that most people have never heard of.